The nation's largest natural habitat refuge for Asian and African elephants retired from performance and exhibition. 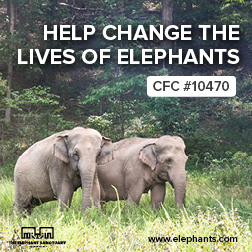 Improving elephant lives through sanctuary, education, research and overseas assistance. Billie was born wild in India in 1962. Shortly thereafter, in 1966, she was captured, separated from her family, and exported to Southwick Zoo in Mendon, MA. Like most Asian elephants arriving in America during this era, Billie was expected to spend the majority of her life performing and on exhibit. In 1972, Billie was sold to the Hawthorn Corporation, a company that trained and leased elephants to circuses. She spent the next 20 years travelling and performing with a group of elephants known as the Hawthorn Five - becoming increasingly aggressive toward her trainers until she was retired from performance and sent to live in a small barn at the Hawthorn Corporation winter quarters. In the early 2000s, USDA prosecuted the Hawthorn Corporation for violations of the Animal Welfare Act involving inadequate care and mistreatment of its elephants, and as a result Billie and seven other members of the Hawthorn Corporation's elephant herd were sent to The Elephant Sanctuary in early 2006. Billie has made incredible strides at The Sanctuary. In 2011, after five years of protected contact and positive reinforcement at The Elephant Sanctuary, Billie allowed Caregivers to remove her ankle chain - the last vestige of her life as a circus elephant. Today, Billie continues to exhibit increased confidence and bravery as she ventures farther and farther from the areas immediately surrounding her barn - grazing in open meadows, exploring shady forests, and splashing around in the many ponds in her habitat.